First, I've got some good news. Dominique is seriously easy to fit - hooray! We designed it to be super simple so that even first-time stitchers could enjoy making it, without the head-scratching that more complicated patterns can sometimes entail when it comes to fitting it to your unique body shape. The elasticated waistline will fit to your waist with minimal effort, and also means that you don't need any darts or other more complex kinds of shaping. The first thing to do is find your size. Take a look at the body measurements chart in the pattern instructions – it’s on the page named ‘Find Your Pattern Size’. Wrap a flexible tape measure around your waist to take your measurement – your natural waist is where you bend at the side. Take your hip measurement too – wrap the tape measure around the fullest part of your hips. Don't worry about leaving extra space for movement - we've added that to the pattern. 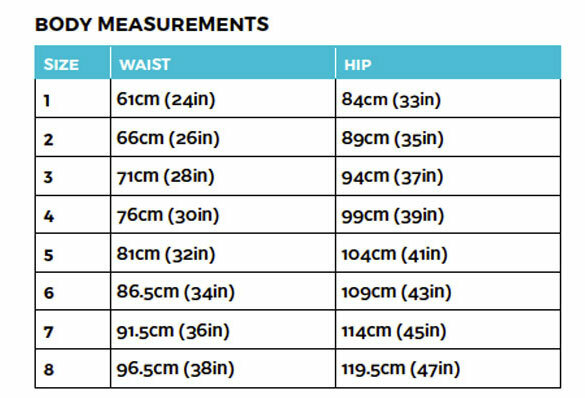 Find your nearest waist and hip measurements on the ‘Body Measurements’ chart. 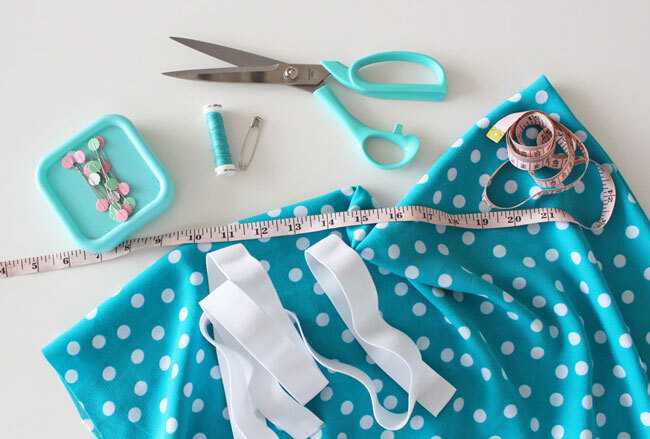 If a measurement lands between sizes, it’s safer to go with the larger size – you can always take it in later, whereas it’s trickier to let out a skirt that’s too small. What about if your proportions fall across sizes? So, for example, if your hips are one size and your waist is a different size. That’s perfectly normal! With many patterns, what you’d do in that situation is blend the two sizes together, by drawing a diagonal or slightly curved line on the pattern side seam between your waist size and hip size. With this pattern, you can usually get away with not doing that, as the elastic does the job of fitting the fabric to your waist. 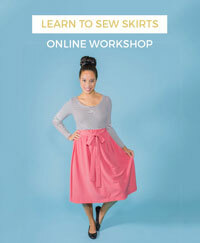 If you’re making the straight skirt, simply pick the size that fits your hips. Easy! The elastic will then fit the waistline to your natural waist. If you’re making the flared skirt, in most cases you could also pick the size that fits your hips. But if your waist size is more than four sizes larger than your hip size, choose a bigger size than your hips – if your waist is five sizes larger than your hips, choose one size larger than your hip size; if it’s six sizes larger, choose two sizes larger than your hips, and so on. Choose the sash size according to your waist size. What about if your measurements are larger than the pattern? Our patterns come in eight sizes, from UK 6 - 20 (we call them 1 - 8). Usually sizes larger than that would require drafting and grading from scratch because of the different body proportions of plus size figures. However, the simplicity of the shape of these skirts mean it’s easy to make a larger size. Yesss! Work out the difference between your hip size and the size 8 (UK 20) pattern hip size (119.5cm / 47in). The skirt pattern piece represents one quarter of the skirt – so divide that amount by four. 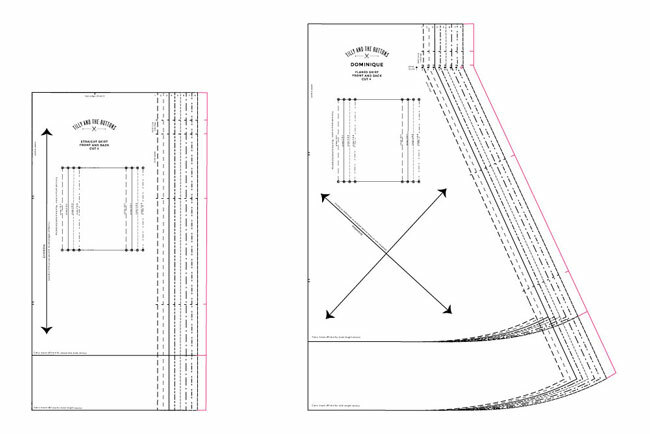 Draw a new side seam line parallel and that distance outside the size 8 line. Add in the notches at the same level as the size 8 notches. If you're making the sash, divide the difference between your waist and the size 8 waist size by three, and add this amount to one of the short ends of the sash pattern piece. Now that you know your size, you can find it on the pattern sheets. Each size is marked with a different style of dashed, dotted or solid line. You're ready to cut your fabric! Looking forward to seeing your Dominique skirts. 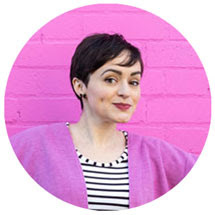 Tag us @TillyButtons on Instagram and use the hashtag #SewingDominique so we can see what you've made!